The Spirit Store is one of the bands favorite venues to play in and if its anything like the past gigs, it will be a stomper! The band has extensively toured all over from Portrush to Cork and everywhere in between and has headlined gigs like the Empire in Belfast and The Button Factory in Dublin. 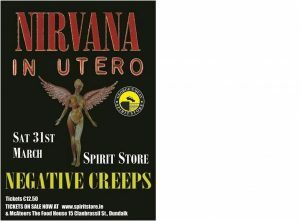 Don’t miss your chance to see Negative Creeps recreate the intense, raw sound of live Nirvana! With songs taken from across the bands entire back catalogue, come experience the music of Nirvana as it should be, LIVE AND LOUD! Come as you are.